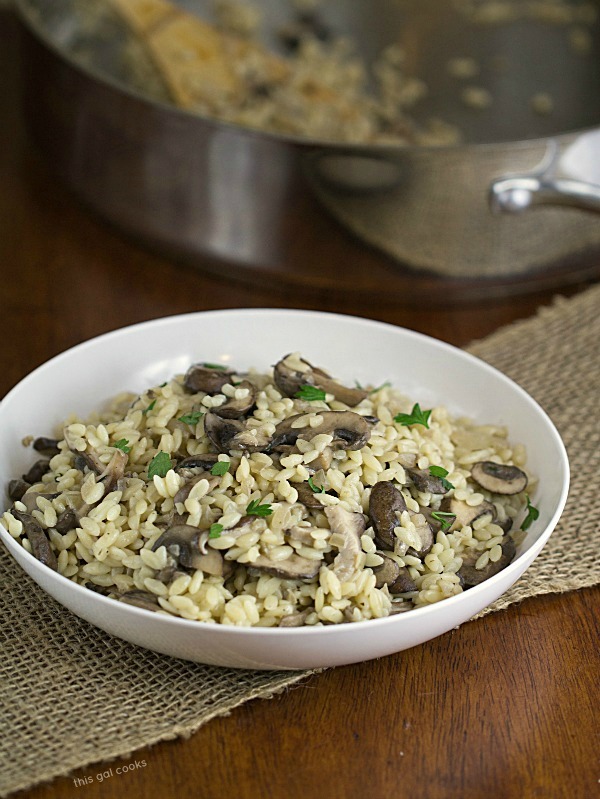 Mushrooms are sautéed in a light sauce and then tossed with orzo to create this Savory Orzo with Mushrooms dish. 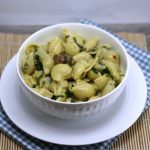 You can serve this simple recipe as a main dish or as a side. This recipe almost didn’t happen. It was a Saturday evening. Ken was busy organizing our garage and I was having fun with furniture in my dining room. I was working hard at transforming my Ikea cube bookshelf into somewhat of a coffee bar slash breakfast bar. Well, I wouldn’t really say I was hard at work. All I did was set it on the floor lengthwise and place my K-Cup machine on top of it. Then I placed a small bowl of K-Cups, some coffee mugs and other novelties on top of it. It looks pretty rad, especially with the Jack Daniels sign propped atop it. So by this time, I was pretty hungry. I almost ordered take out but I was too lazy to go pick it up. I decided to try out a recipe that I found in the most recent Food Network magazine. Instead of using the wild rice that the recipe called for, I would use orzo. I started cooking the pancetta and then proceeded to add a splash of sherry to the pan. Big mistake. The pan was too hot. A huge cloud of smoke (or maybe vapor) burst into the air. And then my house was smoky. And it didn’t smell good at all. Not to mention that I was afraid my smoke alarms were going to go off. Or worse, my fire sprinklers would give my house a shower. None of that happened. But this did. After my frustration wore off, I decided to throw my own recipe together. Sorry Food Network Magazine. But don’t you worry, there are a ton of other recipes in your magazine that I want to make. I made sautéed some onion, garlic and fresh thyme in some butter and turkey stock. Then I added some sherry and mushrooms (no crazy smoke incidents this time) and cooked the mushrooms until tender. Cream, ground pepper and a dash of salt finished off this sauce. I tossed the mixture with some cooked orzo and then sprinkled it with a little parsley. Yum. A simple gourmet type dish without all the elbow grease. In a large skillet, melt the butter, Add the onion, garlic, thyme and turkey stock and cook until the onion is tender. Stir occasionally so the onion and garlic do not burn. Add the sherry and mushrooms and cook until tender.Add cream, salt and pepper to taste, mix well and then remove from heat. This recipe will make about four one cup servings or about 8 half cup servings. Well, glad it all turned out! 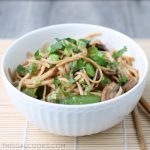 I’m a fan of orzo pasta and a mushroom lover – this looks very tasty! Pinned! Your version is awesome! I would most definitely make this a meal!! And yeah for no smoke! Julie, This looks like a nice and easy recipe. I’ve discovered that sherry/brandy is my new secret ingredient in sauces and gravies. Looking forward to your fabulous recipes in 2014. Happy New Year! Thank you so much, Joan! I love the nutty flavor of the sherry. I tend to use it more than white wine now! What a great looking side dish, Julie! 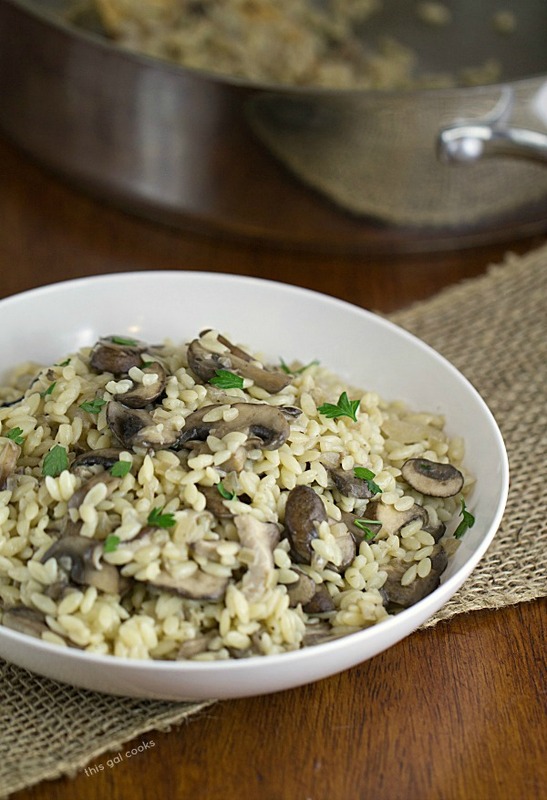 You’ve got two of my favorites paired up — orzo and mushrooms — so I know I’d love this. Isn’t it nice when things don’t work out and you end up with something even better? Looks absolutely delish! And very Italian! 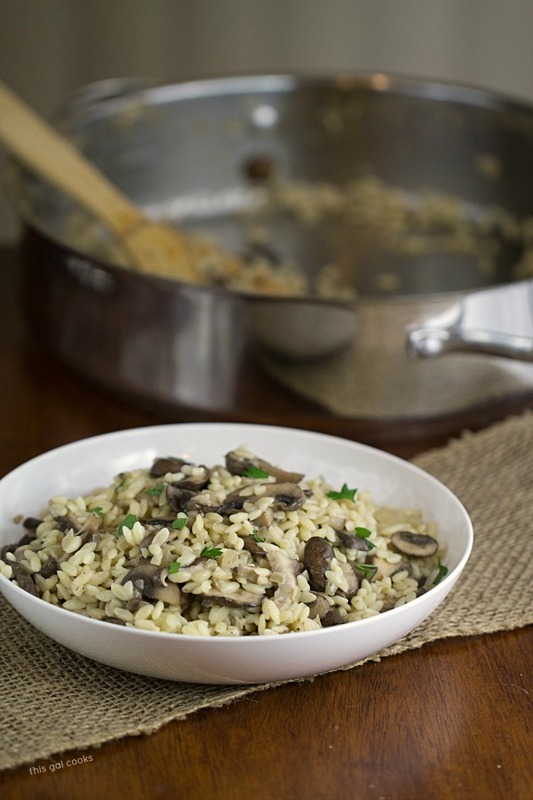 This mushroom orzo looks awesome! Yay for your non-smoky version, it sounds so flavorful and tasty :) Have a great weekend Julie! I am a big fan of mushrooms!! This looks like the perfect dish for me to whip up for a weeknight meal for myself when the kids just want to eat frozen pizza!! I’m glad you like is recipe, Renee! Thanks for stopping by! 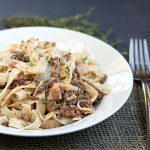 I love fresh thyme and mushrooms together, plus orzo is such a fun pasta to eat. Looks like rice but it’s pasta and absolutely delicious! :) glad you did this instead of the good network magazine, yum! Pinning Julie! Orzo is one of my favorite pastas to eat. It doesn’t make me feel totally stuffed from eating too much! Thanks for stopping by, Krista! Haha love the story and happy your house didn’t get a bath! This dish looks awesome! Yikes! You had quite the scare there Julie. Glad to hear your version didn’t smoke up. :) This sounds awesome! I love mushrooms so I know I’ll love this. Happy New Year girl. :) Have a great rest of your weekend. I can’t believe this is actually that easy to make: it looks so fancy! Si glad it turned out great in the end by the way! Looks like such a great meal, I love mushrooms (can’t get enough) so I definitely have to try this out! Have a great Sunday!